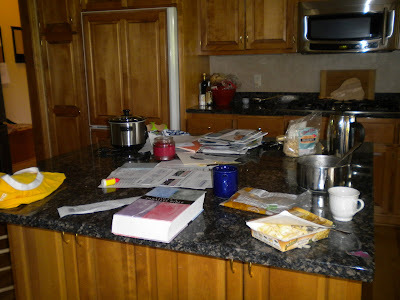 Here is a picture of my kitchen island at one point in time yesterday. Yesterday was a hard day. It was chaotic and cluttered from the moment I got up (late) until I put my weary head on the pillow (also late). But do you see that book there in front? It's a Bible. That book is my lifeline, my anchor, my escape INTO reality. If you don't have one, get one. Read it. Seriously. Wow. I needed to be reminded of this precious book that I own! Thanks!